Senior John Kopriva started all 35 games of the 2014-2015 season after sitting out of the starting lineup for his sophomore and junior seasons. The forward averaged 6.7 points and 3.7 rebounds per game in his senior season. At the beginning of John Kopriva’s senior season, head coach Mike Lonergan gushed about the forward’s “leadership” and “intangibles” as he got ready to move into a starting role. Note that Lonergan wasn’t touting Kopriva’s physical abilities or statistical production. “He’s going to be a doctor someday,” Lonergan even said. In that context, it sometimes read as an excuse. Kopriva has never been a star on the court, often winning more accolades for his academic performance than his athletic prowess. 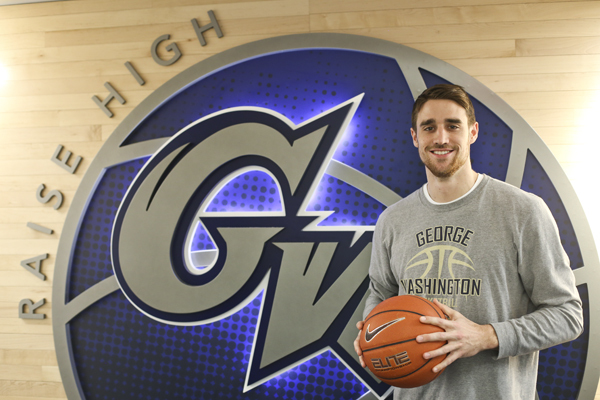 Kopriva has been on the front lines as a less-than-lackluster program transformed into an NCAA Tournament team under Mike Lonergan, who became head coach the year Kopriva arrived at GW. At first, that transformation pushed Kopriva out of the spotlight in favor of larger contributors. But as a senior, it seemed like Kopriva finally found his place on the court. He started every game and improved nearly every aspect of his game. When Kopriva was a freshman, he started in his first 17 games. But as the team began to struggle through what would be a 10-win season, Kopriva became more and more familiar with the bench. His sophomore year, the team missed the postseason again. Kopriva saw even less playing time thanks to four exciting rookies who took up minutes. It was his junior year when the team made the big leap, making the NCAA Tournament for the first time since 2007 and selling out the Smith Center. But Kopriva still played just 12 minutes per game, overshadowed by bigs like Isaiah Armwood and Kevin Larsen. When Armwood graduated, it was time for Kopriva to take on a larger role. When Lonergan asked him to contribute about five points and four rebounds per game, Kopriva knew there were many skeptics who didn’t think he could do it. The Colonials’ season ended on March 22 in a loss to Temple in the NIT’s second round, and the 6-foot-8 forward had an average of 6.7 points and 3.7 rebounds per game and shot 48.6 percent from the field. He also posted a 44.2 percent clip from three-point range, second-best on the team, sinking 19 out of 43 from beyond the arc. Armwood spent his final months at GW working out for NBA teams and went on to start a professional career in Europe. But that’s never been Kopriva’s plan. He has known he’s wanted to go to medical school since he came to GW. So when the season ended, Kopriva knew his basketball career was ending too. Not all of the Colonials’ goals – an Atlantic 10 Title and NCAA tournament berth – were realized during Kopriva’s senior season. By Senior Day on March 7, the team was likely out of the running for an at-large berth and sat at sixth in the conference. But after an 87-65 win over Massachusetts, Lonergan and the rest of the team congratulated Kopriva on his final performance on the Smith Center hardwood. Kopriva will take next year off. He doesn’t know what he’ll do with the time yet, but said he’d spend it either in D.C. or Milwaukee, his hometown, and then go to medical school. He said he always wants to keep basketball, and sports in general, in his life and would consider doing so through a specialty like sports medicine or orthopedic surgery, but he’s going into medical school with an open mind. Kopriva has always balanced his chemistry major – and Athletic Academic Dean’s list honors – with basketball during his time on campus. Last summer, in addition to training, he focused on preparing for the MCATs. Kopriva also took organic chemistry over the summer when his basketball requirements weren’t as heavy. Now, he again has more free time than he’s used to having. Kopriva said he’ll enjoy his now-free weekends until graduation to explore some restaurants in D.C. and visit a friend in Indiana who he’s never been able to visit during college. He joked that he could expand the “barbershop” that he runs out of his room in South Hall for his teammates. Joe McDonald, Paul Jorgensen and, most recently, Ryan McCoy have let their locks go under the “Kopriva Kutz” knife wielded by their two-year team captain. Kopriva said his room in South Hall and his former rooms in Potomac House, FSK Hall and 1959 E St. frame many of his memories from the last four years. But over the last two seasons, sellout crowds and Kopriva’s own progress made the Smith Center a more frequent backdrop for his highlights, which he said makes him feel grateful as his time comes to a close.